Terrorist murders 31-year-old, wounds two, in town of Adam, near the capital. Terrorist eliminated. 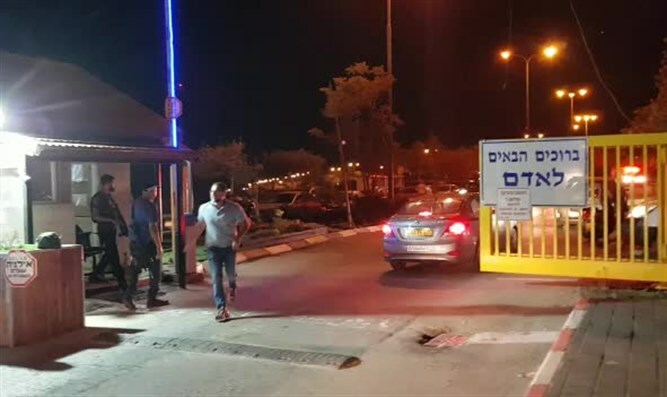 A 31-year-old Jew was murdered on Thursday evening in a stabbing attack in the town of Adam in the Binyamin region, near Jerusalem. He was evacuated to the Hadassah Medical Center on Mt. Scopus in Jerusalem, where he later died of his wounds. Two other people suffered moderate and light injuries in the attack. They are hospitalized at the Hadassah Medical Center on Mt. Scopus and the Shaare Zedek Medical Center in Jerusalem. An initial investigation revealed that the terrorist entered the town after jumping over the security fence. Upon entry, the terrorist stabbed two people who were sitting outside a house. A neighbor who arrived at the scene assumed that a fight had broken out, and after being stabbed himself, fired three rounds of bullets at the terrorist killed him. According to an eyewitness, at this point the terrorist was hit by a car passing in the street. MDA paramedic Orel Assulin said: "When we arrived at the scene there was a commotion, 2 men were lying on the road in severe condition with stab wounds to their upper bodies. We provided life saving treatment including bringing the bleeding under control and they were quickly evacuated to Hadassah Mt. Scopus. During the evacuation one of the injured's condition deteriorated and we performed CPR. An additional 50 year old was treated and evacuated in light condition together with a woman suffering from stress symptoms." Initial reports suggest that the terrorist infiltrated the town and broke into a house where he stabbed the occupants. The residents were asked to remain in their homes until the security forces finish their search of the area to determine whether there are other terrorists. The attack comes almost exactly one year after the massacre of the Salomon family in nearby Neve Tzuf.